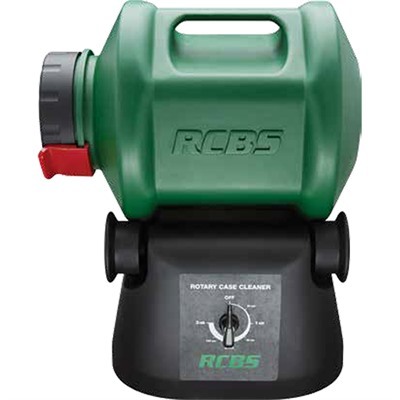 The RCBS Rotary Case Cleaner uses tumbling action to scrub all surfaces of the cartridge case. Rather than the violent shaking of a vibratory tumbler, the RCBS Rotary Case Cleaner is a true "tumbler" that cleans the brass gently, like an old lapidary tumbler. The result is a lot less noise - in part thanks to the rubber lined drum - and less wear and tear on your cases. And extending case life is good for your bottom line - part of the whole point of reloading, right? RCBS gave their Rotary Case Cleaner a smooth, belt-driven motor that rotates the drum at a steady 60 RPM to ensure uniform cleaning. You can set the timer for up three hours of continuous cleaning action. And there’s even an easy-to-grasp ergonomic handle on the drum to make loading and unloading of the Rotary Case Cleaner easy. The RCBS Rotary Case Cleaner even comes with 5 lbs. of magnetic stainless steel media. Stainless media is pretty much indestructible, never needs renewing or replacing, and does a heckuva thorough job on even the most oxidized, gunked up brass.